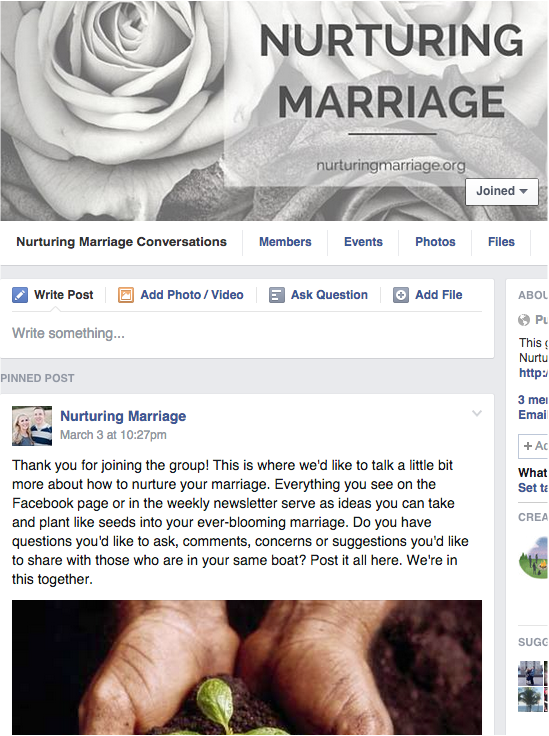 We are THRILLED that you want to join our new Nurturing Marriage Conversations Facebook Group. Here are the steps you need to follow in order to join the Nurturing Marriage community. 2. In the search bar at the top, type in "Nurturing Marriage Conversations," (without the quotation marks, of course!). Or simply click on this link. 4. Wait for your status to be approved by our team here at Nurturing Marriage. You will now be able to see everything in the group, but won't be able to comment just yet. 5. Once your status is approved, and you become a member of the group, you can join the conversation! We can't wait to hear from you! Do you have a great date-night idea to share? Or a question that you need advice about? This group is the place where the Nurturing Marriage Community can now come together to share suggestions and advice that will help each of us in our efforts to nurture our marriages. P.S. Now that you are a part of the group, you can manage your group settings (and even mark us as a "favorite" group) in your sidebar under the "GROUPS," tab. You can also edit your notifications settings under "Manage My Groups," so that you don't get notifications for every single comment ever posted in the group (unless you like that type of thing. :)). Thanks for joining our Nurturing Marriage Conversations Group! We look forward to carrying on the conversation with you on Facebook!